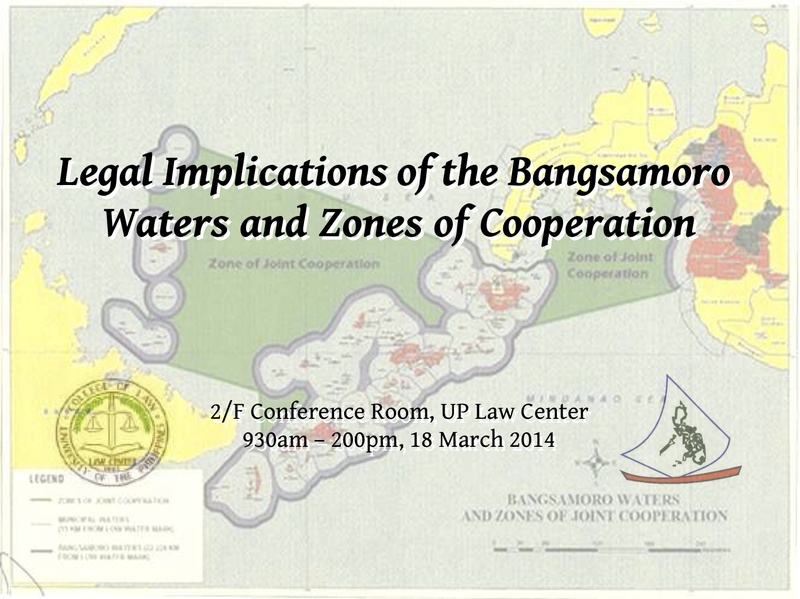 On Tuesday, March 18, the University of the Philippines Institute for Maritime Affairs and Law of the Sea (UP-IMLOS) will be hosting a symposium on the legal implications of the latest addendum to the Bangsamoro Framework Agreement. Signed on January 25, 2014, the addendum supplements the earlier provisions of the Agreement on the wealth-sharing scheme to govern the relations of the Philippine Government and the resulting Bangsamoro entity, with the emergent concepts of Bangsamoro Waters and Zones of Joint Cooperation in the Sulu Sea. Government Peace Panel Chairperson Miriam Coronel-Ferrer, also a professor of political science at the UP, will provide a background on the Agreement and the Addendum, and their salient provisions. 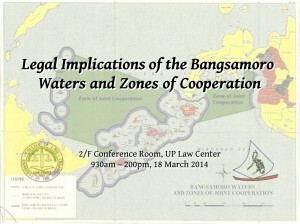 UP-IMLOS Director Prof. Jay Batongbacal, meanwhile, will discuss how the “regional waters” up to 12 nautical miles from the low-water mark of the coasts of the land territory of the Bangsamoro and the “zones of cooperation” relate to natural resource allocation schemes under current law. UP Law Professor Dan Gatmaytan will explore the implications of the creation of what is essentially a “super-autonomous” region in the south. Former UP Law Professor Diane Desierto, now co-director of the ASEAN Law and Integration Center (ALIC) at the University of Hawai’i, will delve into the investment implications of the Framework Agreement. The talks will provide the groundwork for participating agencies and stakeholders to discuss the best ways of implementing the agreement through the prospective Basic Law for the Bangsamoro. The workshop will be held from 9:00 A.M. to 2:00 P.M. at the 2nd floor conference room of the UP Law Center (Bocobo Hall), Diliman, Quezon City. For more information, please call (02)920-5514 local 218. This entry was posted in News and Updates on March 15, 2014 by Pia Benosa.